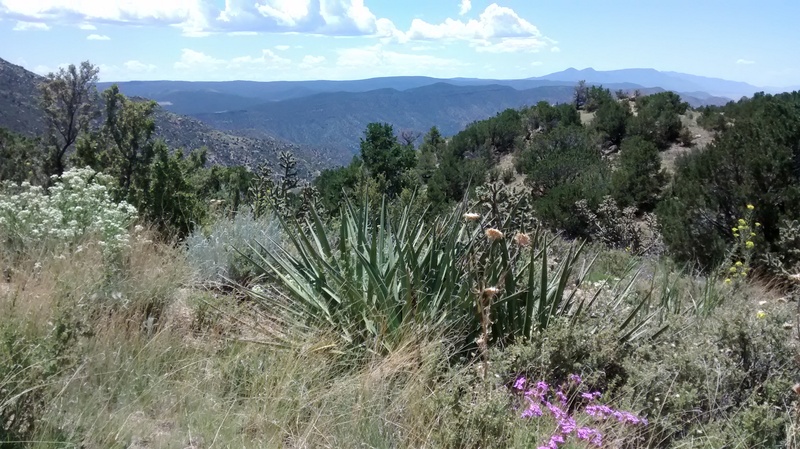 The Santa Fe Hill Climb is coming up this Sunday morning. It is one of the best rides. Registration is open online through today and also available in person Sunday morning. Anyone can do it. All you need is your bike. Take the initiative to ride. I love to spend a Sunday morning climbing up above 10,000 feet in elevation in one of the most beautiful cities on earth. The view won’t be exactly like these photos taken above Albuquerque, but similar indeed. The Southwest monsoon is strong this summer. 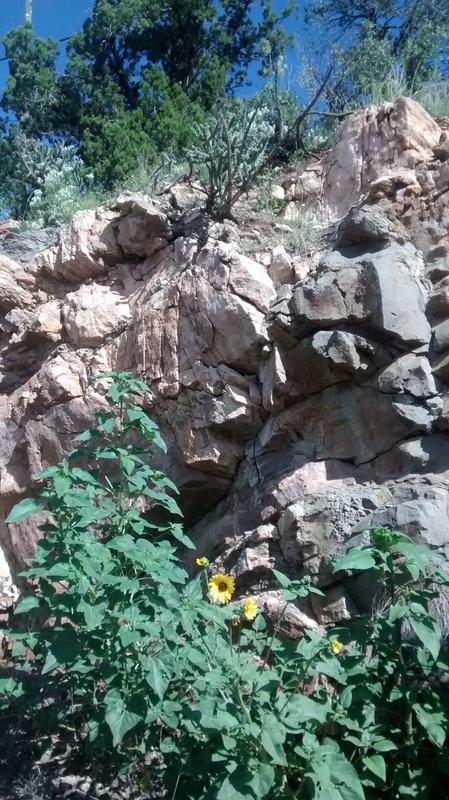 The bouquet of piñon essence in the clear mountain air coupled with the eruption of roadside sunflowers will make a great setting. 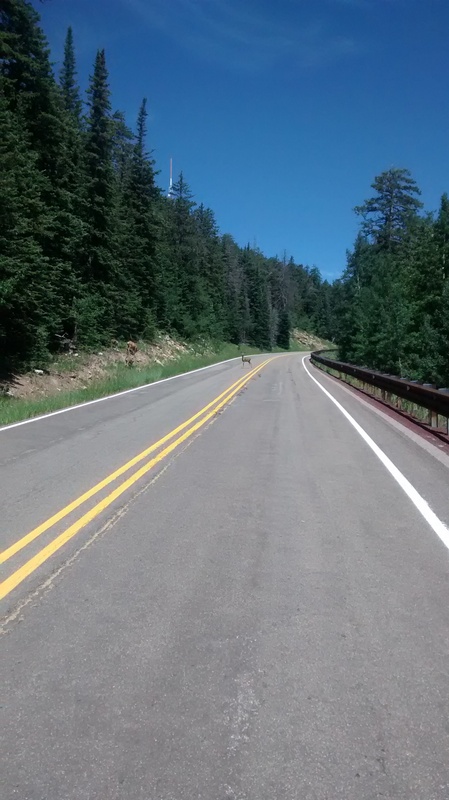 This entry was posted in climbs, exploring by bike on July 31, 2015 by bikeyogiblog. It’s my recovery day after six days of enthusiastic riding. 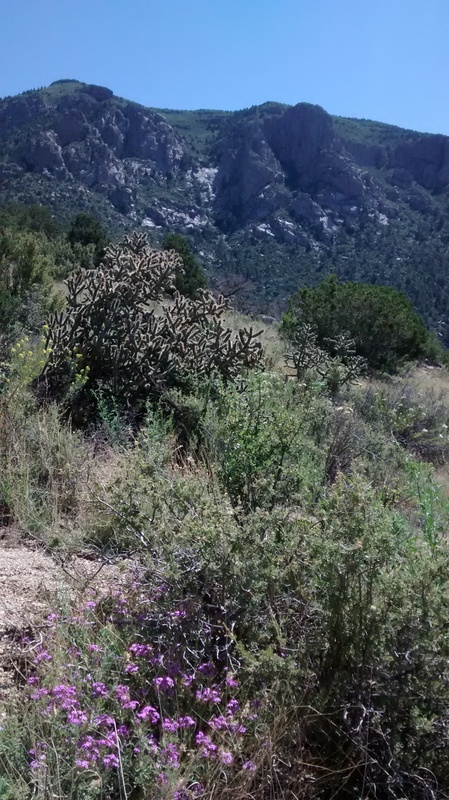 I decide to try active recovery and go explore Embudo Canyon at the top of Indian School Road. 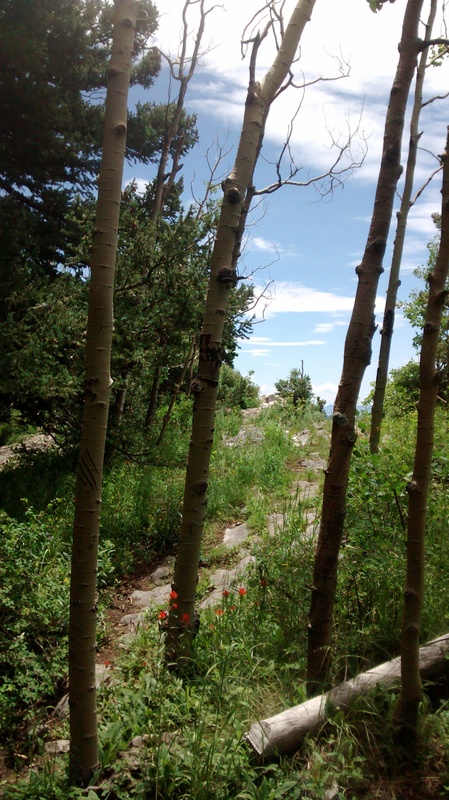 Walking in a place where the desert meets the pine forest helps sooth my mind and body. I soft pedaled through the neighborhood in my Chaco Sandals. No spandex today thank you. Just taking it easy with my sunhat and backpack on. 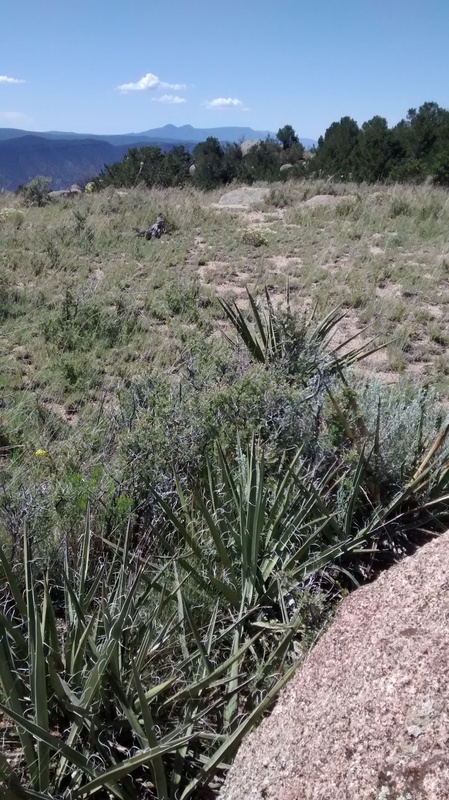 I took the Paseo de las Montañas trail and at the top of Indian School past the water tank I passed the Wilderness Boundary and stashed my bike in the bushes. Hiking time. 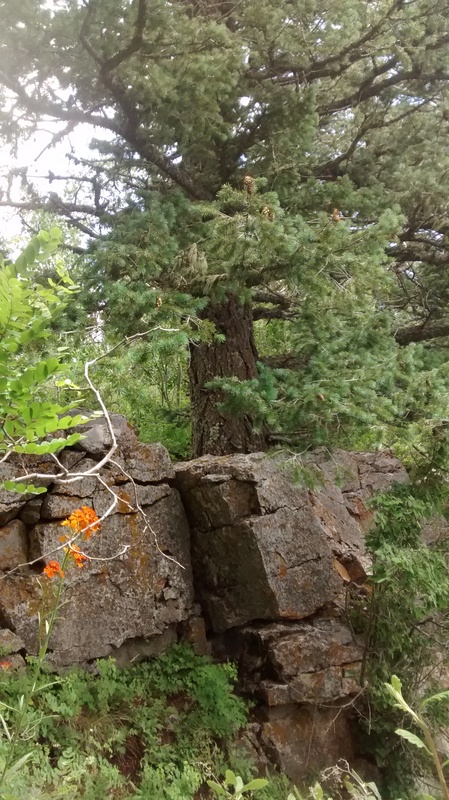 I walked past huge boulders through the narrow canyon neck and the terrain opened up. 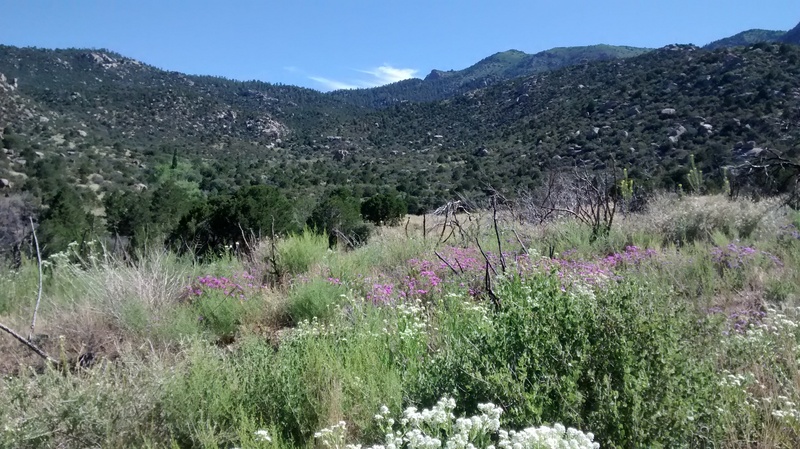 Desert wildflowers flashed against a backdrop of dark green piñon pine, smooth faces of granite rock and deepening blue skies. 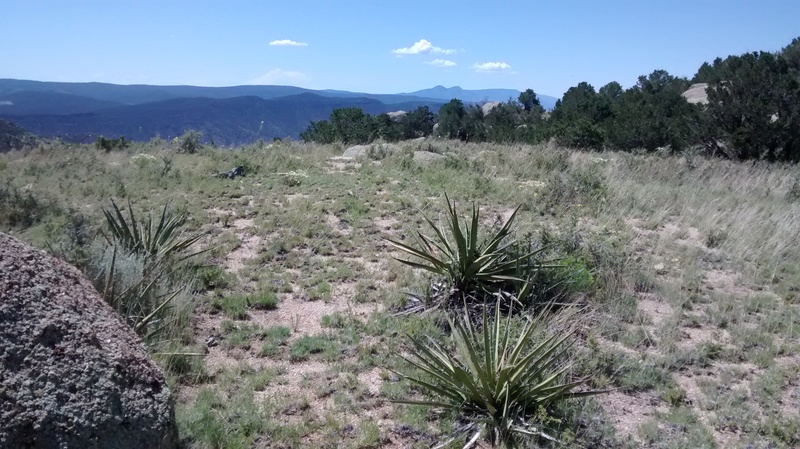 I walked to the Tres Pistoles and Crest Trail junction. 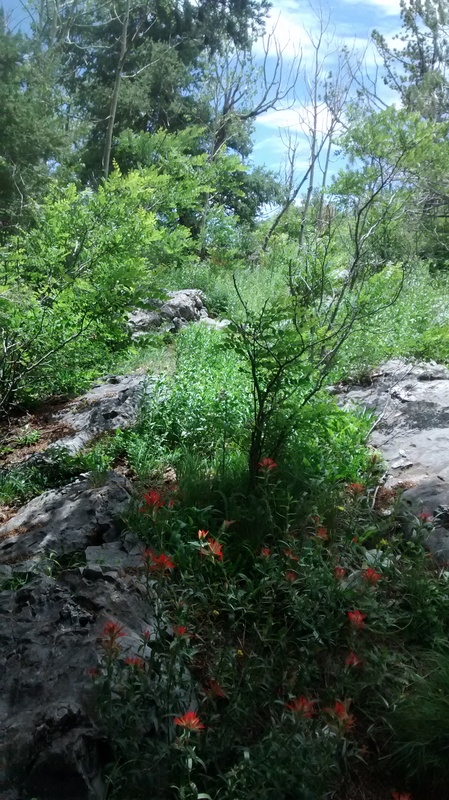 I was drawn up into this mountain wilderness. Right next to Albuquerque but very different. I used this time walking to reflect on the bike work and research I’ve been doing. Murray Gell-Mann’s phrase “you don’t need something more to get something more” keeps ringing in my ears. He’s talking about the fundamental principals of physics, and how complexity flows from simple rules plus innovation. Bicycling and walking work that way for our transportation system. It is the perfect symmetry for building a broader range of mobility freedoms and extending choices to people for getting somewhere. It’s that simple. We need more human scale choices that fit our sensibilities and allow us to apply our powers directly. Sometimes people tell me I’m crazy for wanting people to be freer to bicycle. But the world is changing. Have you heard of the giving pledge? The Gates Foundation has talked Warren Buffet and 137 (so far) super wealthy people to give 50-100% of their fortunes to philanthropy during their life or in their will. It is not the systemic fix for our wealth distribution imbalance but it is an innovative interim solution. Who would of thought, rich people giving their money away. That’s crazy, but it is happening. Credit kindness, generosity, ambition and human ingenuity. 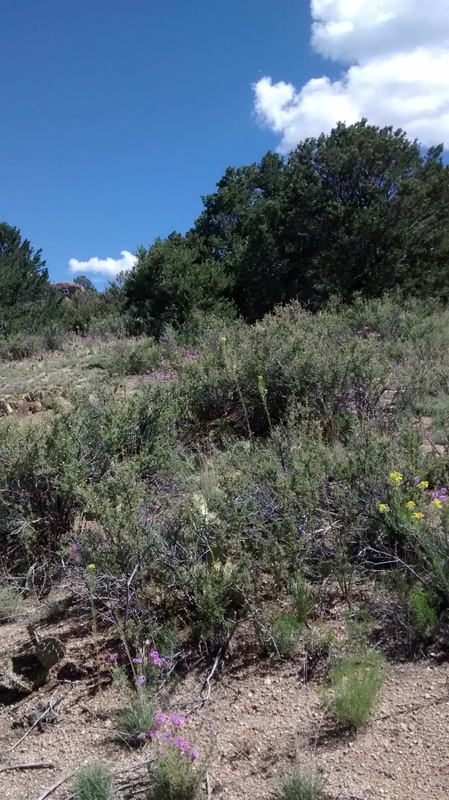 Walking helps me to get a feel for how plant communities fit together and take to the sides of the towering Sandia mountains. 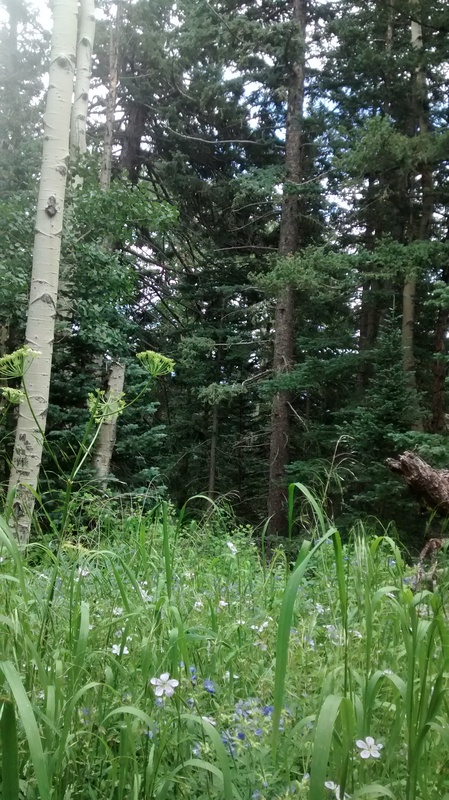 PBS’s Nature showed the science behind how plants talk to each other and cooperate. It makes sense that living things would connect. 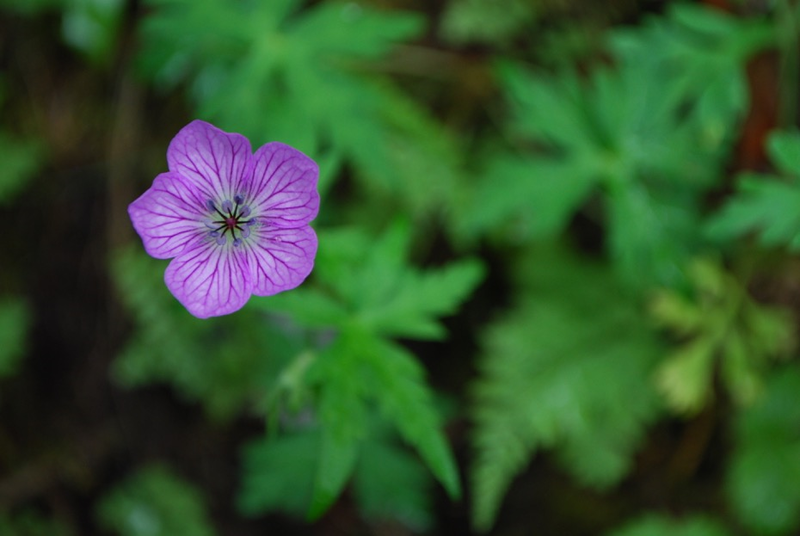 Visible elegance is evidence of how the world works and how living things get along. 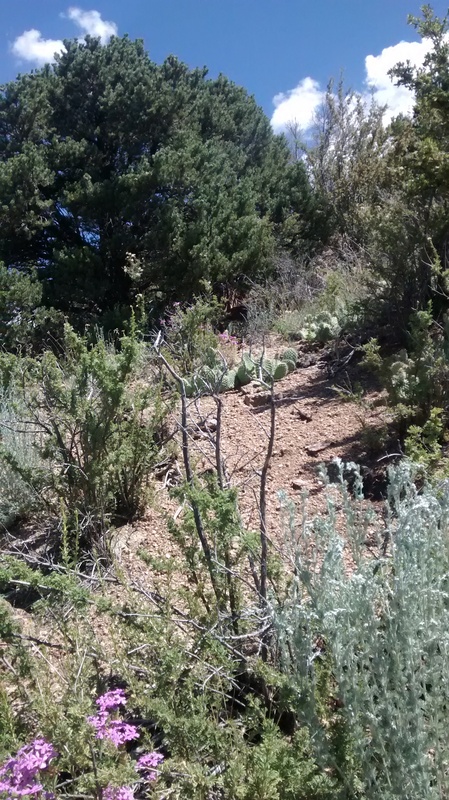 Thanks to the foresight of people preserving this land adjacent to ABQ I had a refreshing hike from my front door. 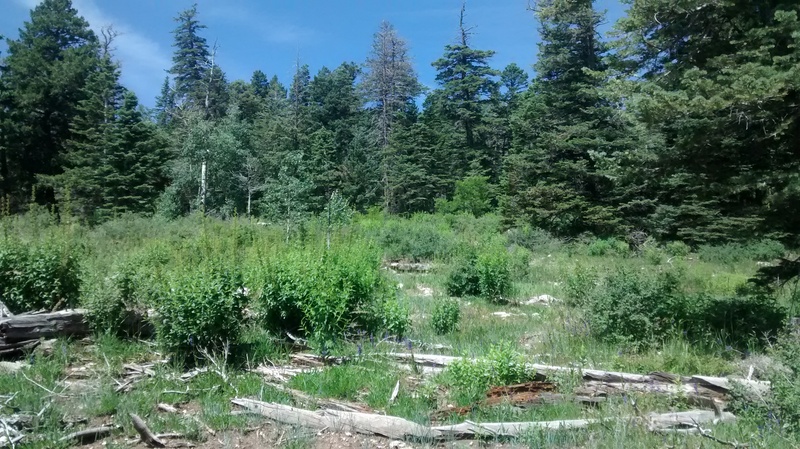 This entry was posted in Bicycling Ecologies, digital humanities, Landscape, Open Space, Recovery, Walking on July 24, 2015 by bikeyogiblog. Albuquerque has an elegant symmetry to it and you can sense this on a bicycle. 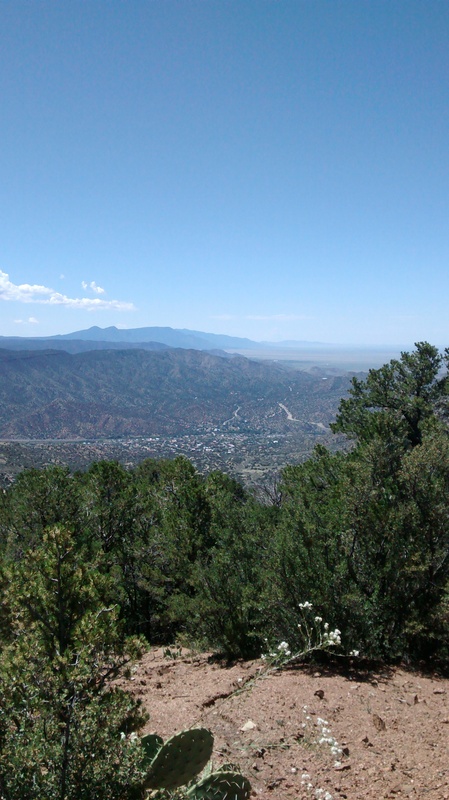 The Sandia Mountains and Rio Grande and West Mesa are all in consonance with each other. 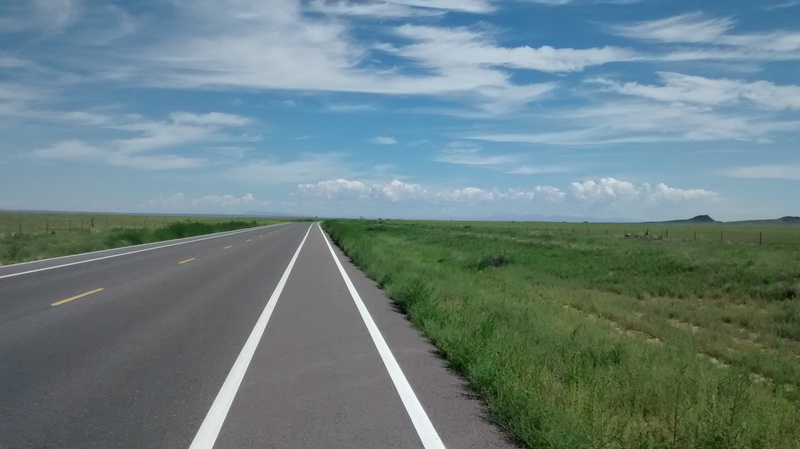 Today I rode out onto the West Mesa. I have never seen it so green. 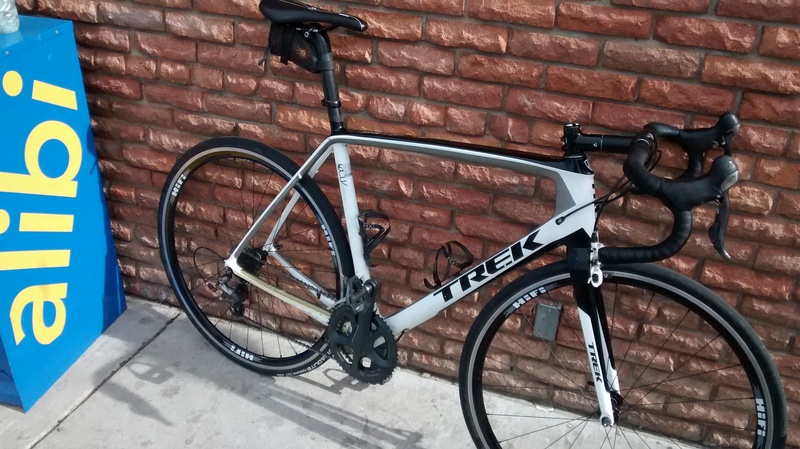 Around Christmas I started tracking my rides on a free program called Strava. Looking at the cool maps and training logs Strava creates, I’ve noticed certain habits. I trend toward staple rides. 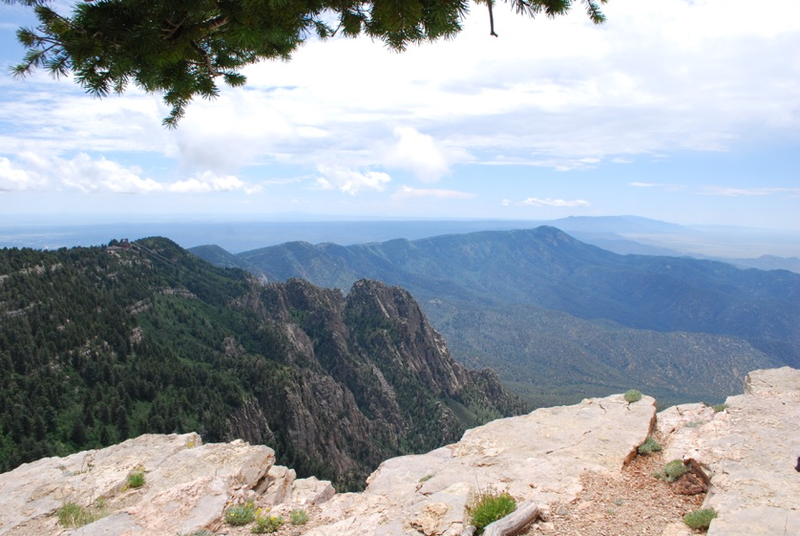 For instance, I like the Sandia Crest, which is the best ride available. 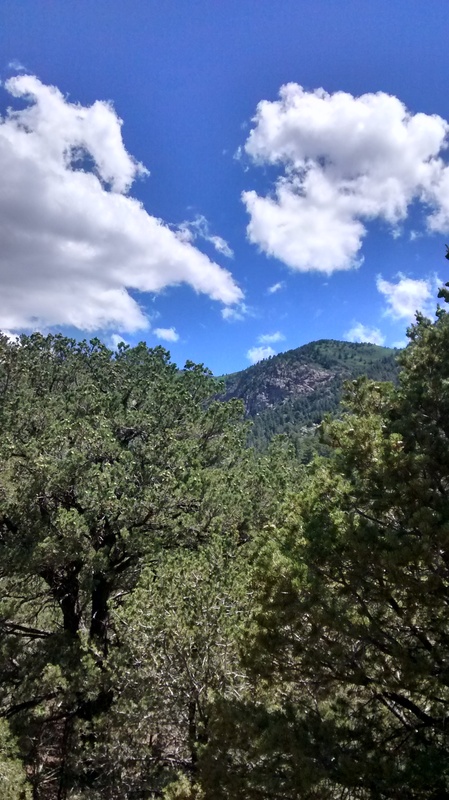 I like La Luz, South 14, Gutierrez Canyon, the Bosque Trail. But today I wanted to do something different and I was feeling satisfied having spent ample time recently on all my favorite routes. 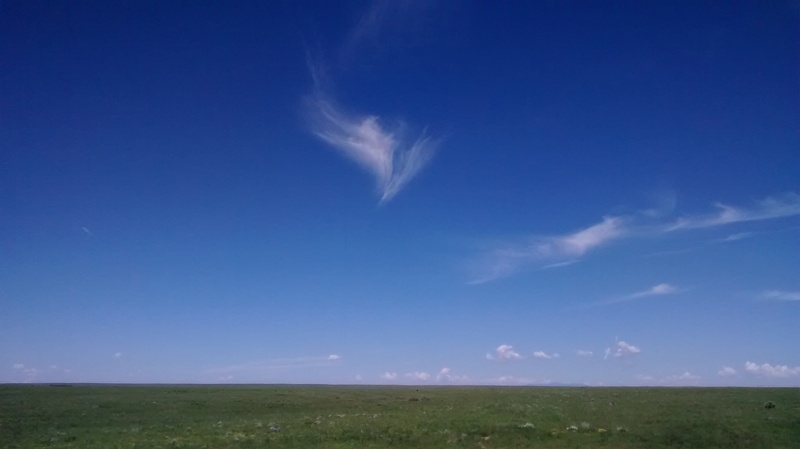 So I did something new and headed through the southwest quadrant out to the West Mesa. The southwest quadrant flows in meandering contours in harmony with irrigation canals and pastures. It is part of the agricultural heartland that runs up and down the Rio Grande valley. These rural roads within our metro area make for interesting riding. It is not the straight up grid system we have on the east side. I left my map in my pocket and got pleasantly lost. One thing I notice all over town is how people connect the different parts of the city together. We do it with neighborhood themes and unifying infrastructure such as main streets and greenways. 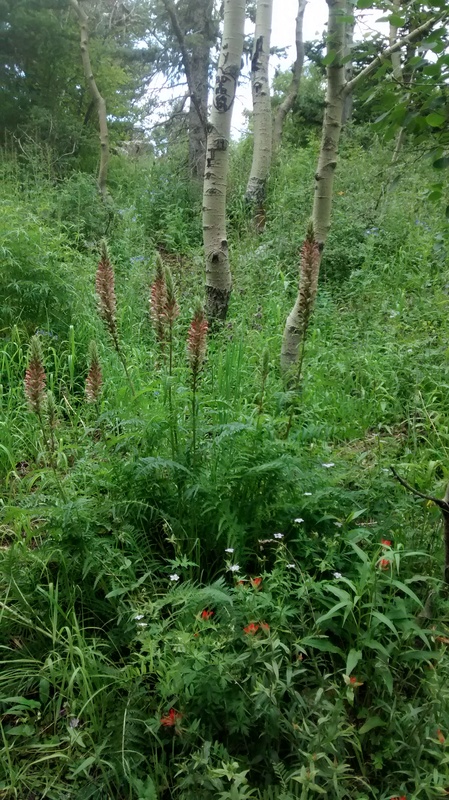 Community emerges from the basics that nature provides. The river, the land, the people. As we make the city more amenable to bicycling we’ll see a more beautiful tapestry emerge. 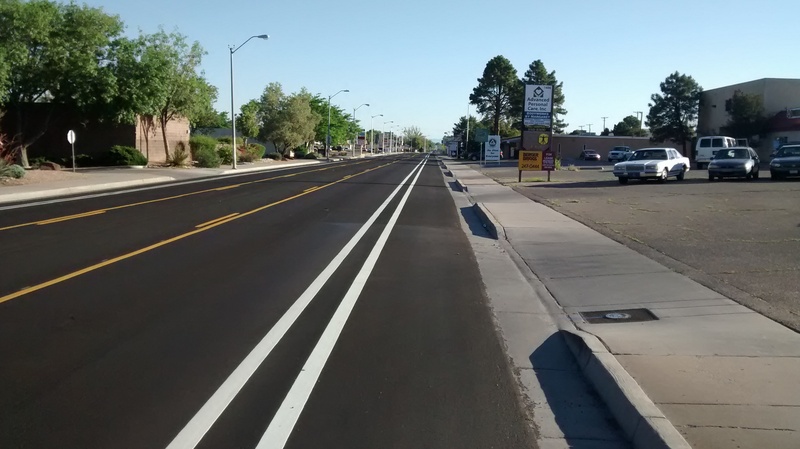 One of the gifts of bicycling in Albuquerque is the tremendous diversity of riding available. 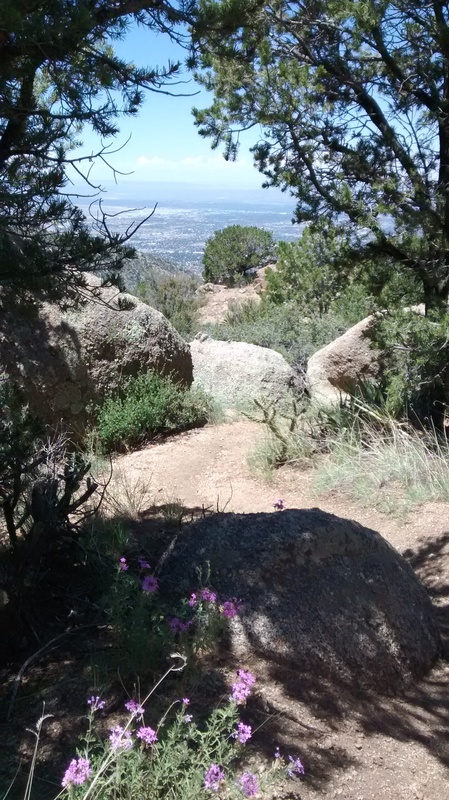 I’ve polished up my skills and learned new ones discovering Albuquerque by bicycle. To get to the best riding in each region of town you end up navigating different types of infrastructure design. The variety keeps me sharp. 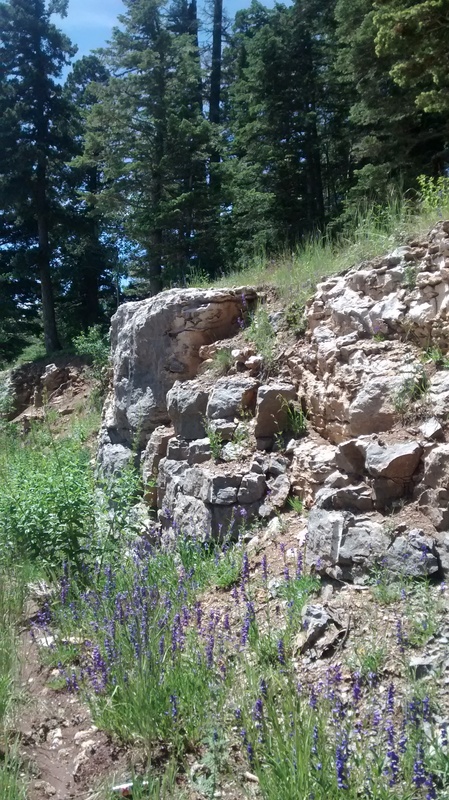 There’s a little bit of every kind of terrain you could think of finding. Bicycling here is like the best of novels or plays. You can go back for the same pleasures and each time you can discover more. Here’s a link to today’s ride on Strava. 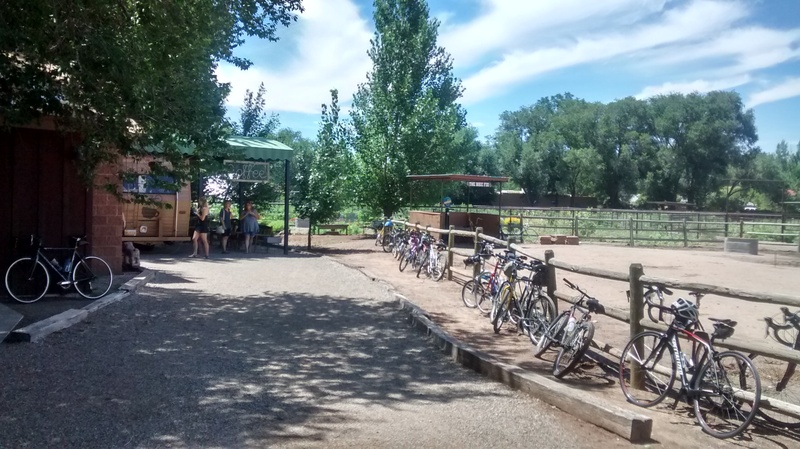 This entry was posted in Albuquerque Bike Culture, Everyday Rides, exploring by bike, planning on July 22, 2015 by bikeyogiblog. I have heroes in life. Most of them are writers. Barry Lopez, Wendell Berry, Peter Matthiessen, EO Wilson, Emerson. Their voyaging curiosities usually interact with science, philosophy, anything and everything to help follow the narrative and tell the story. One of the people I look up to, Cormac McCarthy, has articulated some wisdom in this two minute video below. 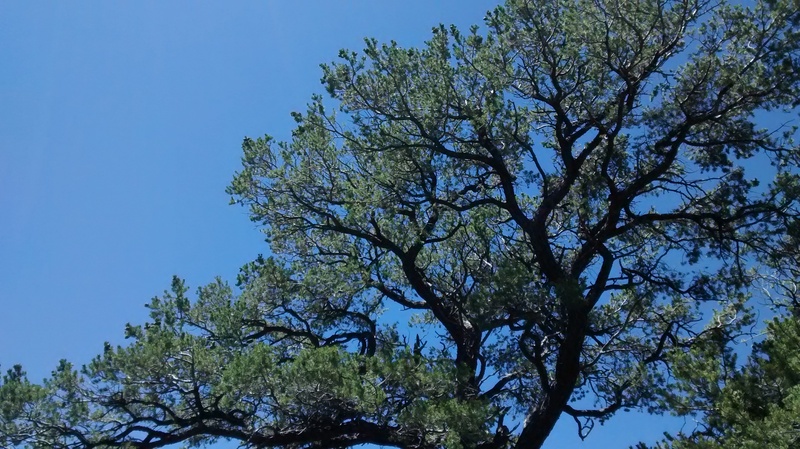 He says the Santa Fe Institute, where he engages regularly, is “absolutely relentless at hammering down the boundaries created by academic disciplines and by institutional structures.” It is also good to hear the focus on sustainability, the environment, and human welfare. It doesn’t narrow down the avenues to achieving improvements in these things, but identifying them as the center points for our pursuits is a timely focus based on what we know at the present moment. It is inspiring to see one of America’s heroic story tellers interacting with science and society. If you have not read Bloom Meridian, give it three tries. Even uber critic Harold Bloom had to put the book down the first two times he tried. “You get a great vision, a frightening vision, of something that is very deeply embedded in the American spirit, the American psyche.” I love the unity of literature, history, and science working to solve the problems we have in front of us today. We need all the help we can get. 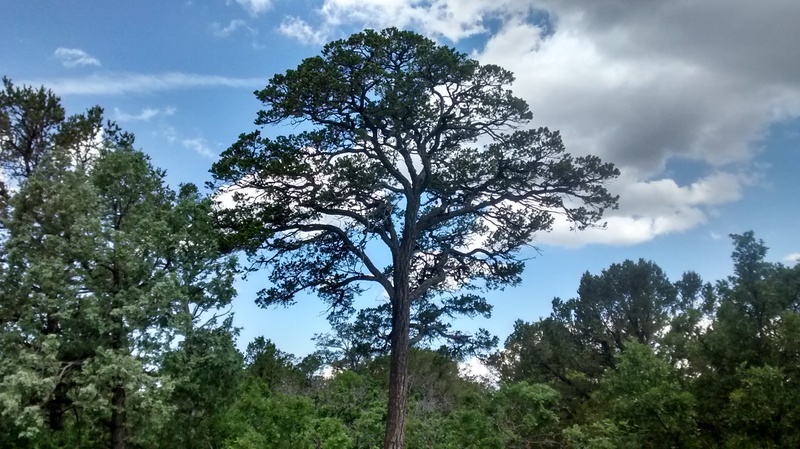 This entry was posted in digital humanities, humanities, literature, science and quantitative analysis and tagged literature on July 21, 2015 by bikeyogiblog. 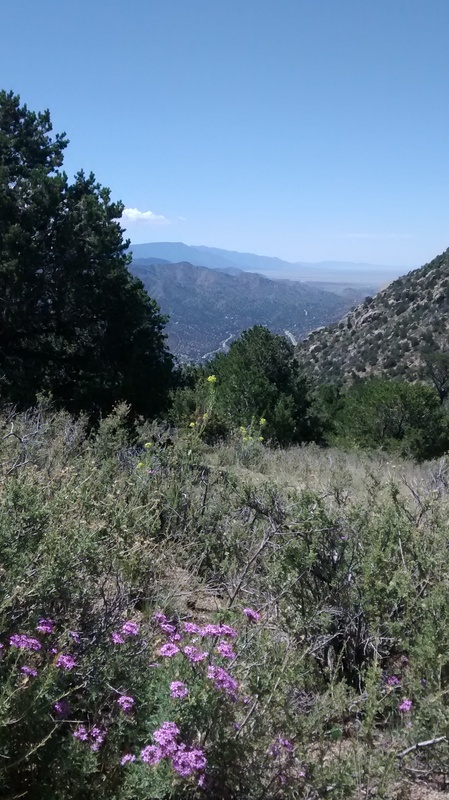 On Sunday I rode my bicycle up to the top of the Sandia Crest and met my wife there for a hike along the Crest trail. 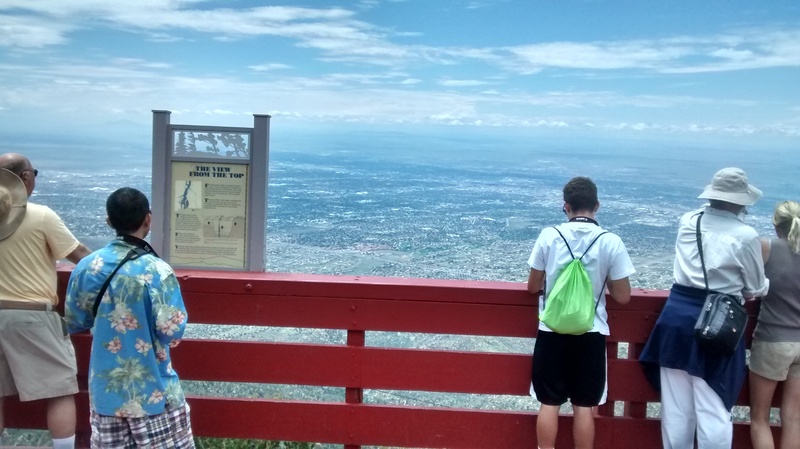 Albuquerque is a mile high in elevation above sea level. 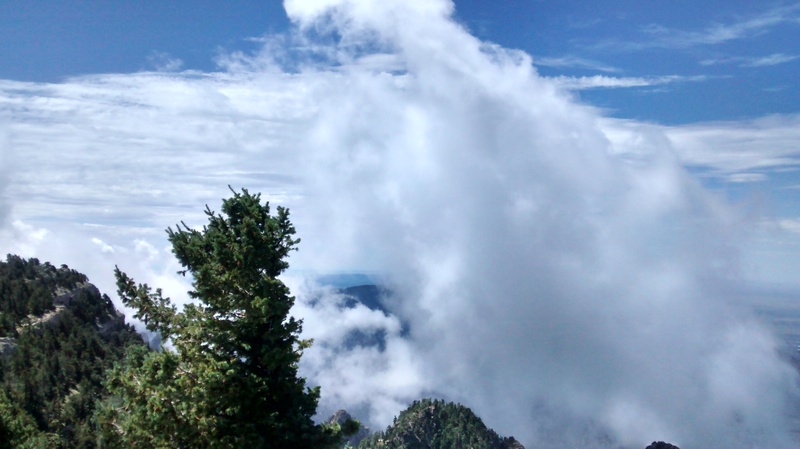 The Sandia Crest is two miles high. While hiking we saw a young girl peering over the mountain’s edge at the city below. She said the cars look like ants down there. Indeed your whole perspective changes on top of the Crest. 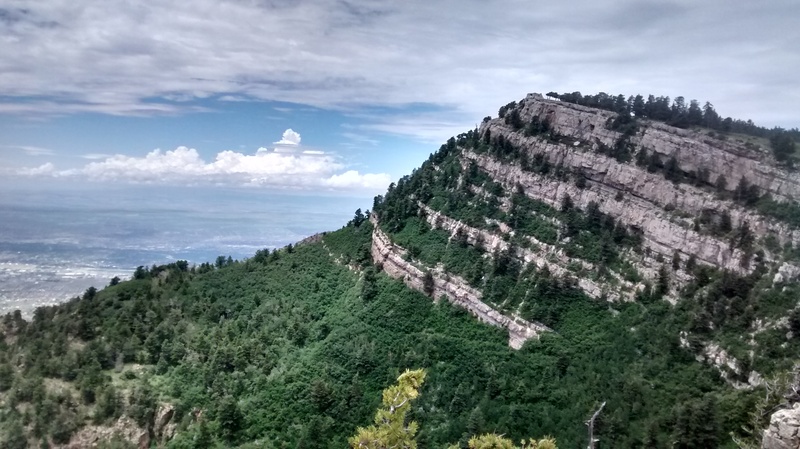 Ranges of mountains span across a huge 360 degree horizon. 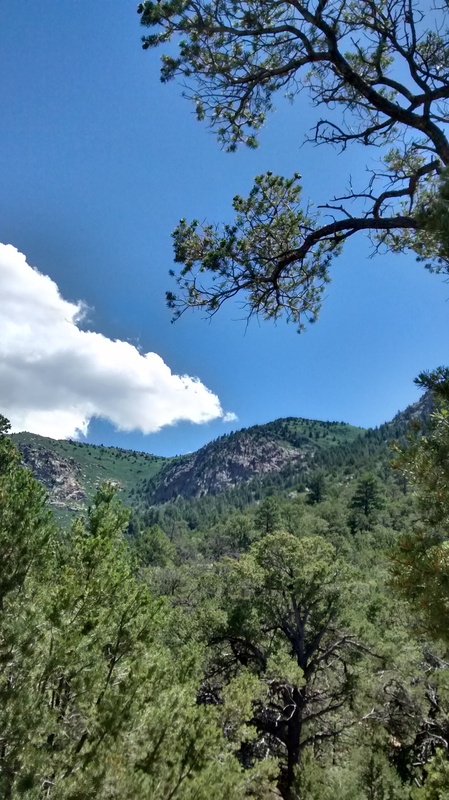 Clouds hang and dance along the Sandia’s edges and swell up high in the early afternoon sky. 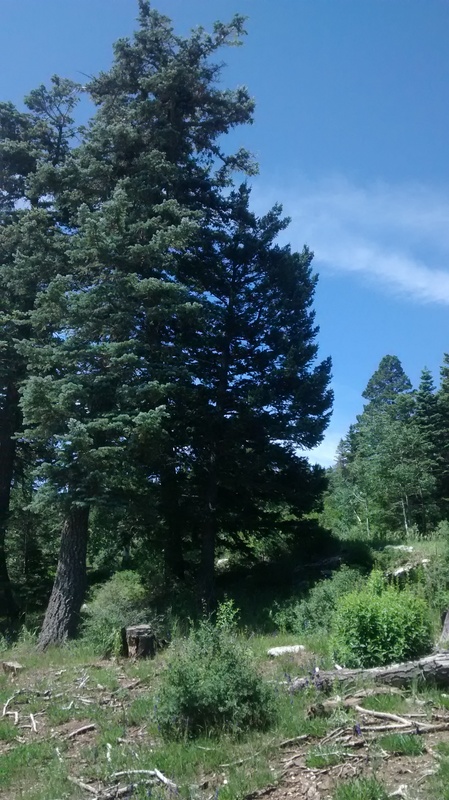 We have lived here since October and this is our first time walking the Crest Trail. 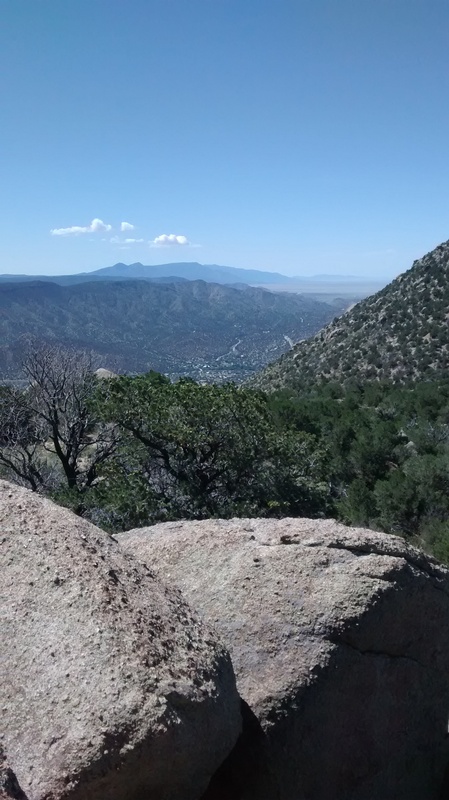 There are so many magnificent things to do that make Albuquerque exceptional, from the Petroglyph National Monument on the West Mesa to the Foothills in the east, to the central bosque green belt and Rio Grande flowing through town. Certainly the Crest has to be the crown jewel. One of the things that came up at the city planning focus groups last Friday was elevating Albuquerque’s image. It was quite apropos from what I’ve noticed since moving here. 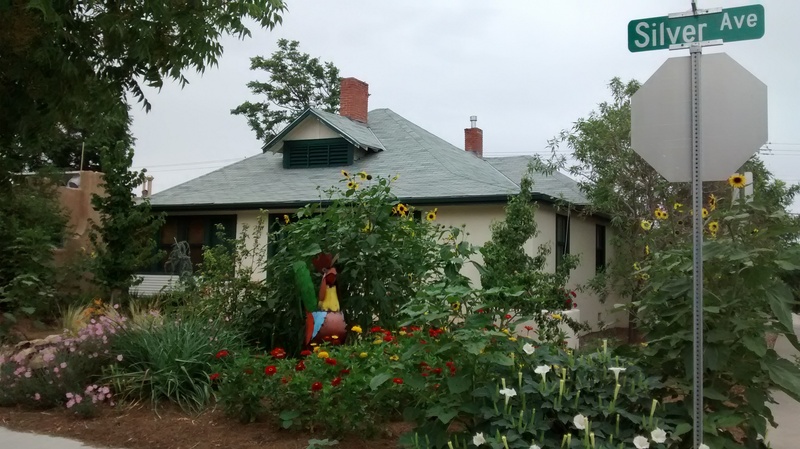 Those in the know understand that what makes Albuquerque unique is a certain richness–in landscape, people, languages, cultures, food–in a searing Southwest combination that is completely unparalleled. But helping people share in that celebration, and making it a coherent vision to put forward is a challenge, and great opportunity for us to advance all the city is. I heard another insight at the meeting that startled me. A planner suggested Austin was a sister city. That is a much better comparison than to Phoenix, Las Vegas Nevada, or another city in Texas. We are smaller and funkier. One thing I notice is we have more mountains than Austin. The top of the Crest is a great place to ponder the city from. The city seems something we’ve created that is an extension of the form of the Crest. Linking the two is a wonderfully scenic road that fits in so perfectly to these tilted mountains. 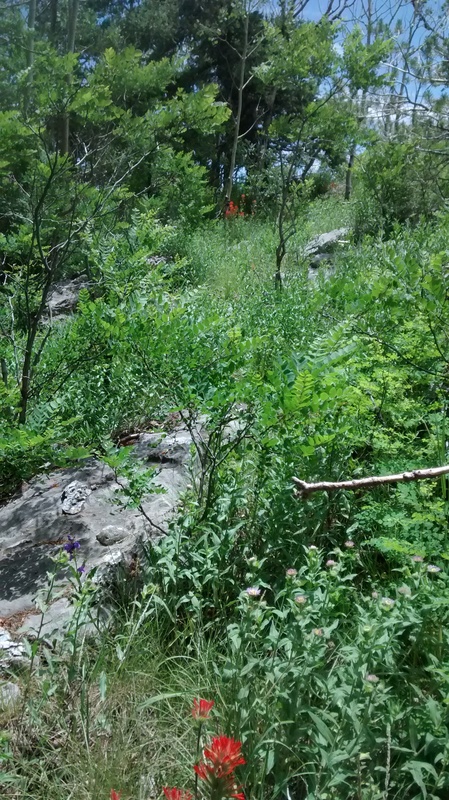 It runs up the thickly forested back side. And there’s also an aerial tramway that you can take from the city. It gives people mobility choices and keeps traffic down on the road to make it a quieter, cleaner and safer ride. 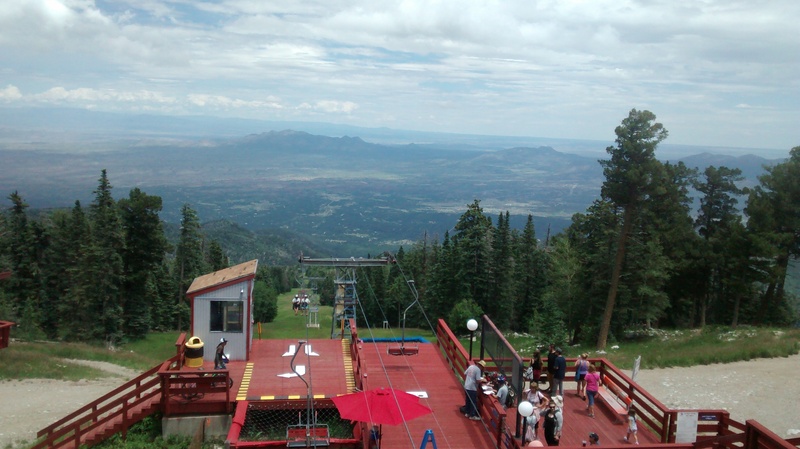 The ski lifts (pictured above) were taking hikers and mountain bikers up and down too. 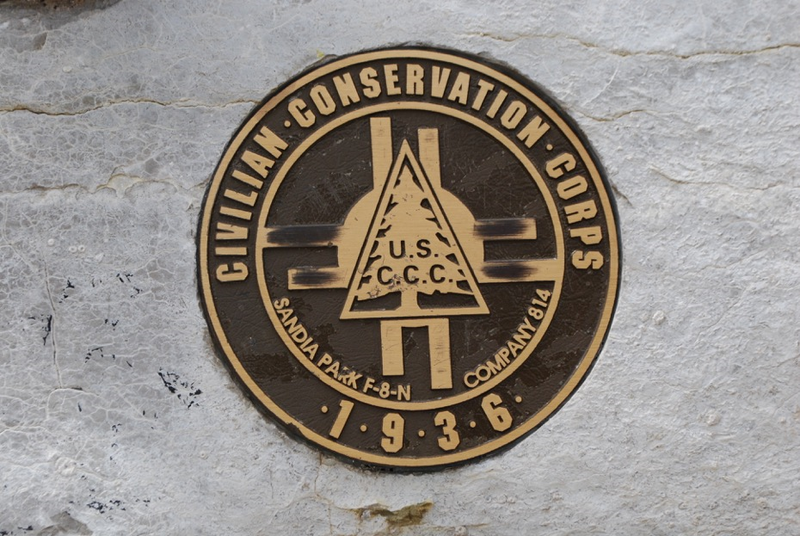 Much of the initial infrastructure was done by the Civilian Conservation Corps in the 1930’s when our country mobilized the workforce to address pressing needs and get people training their skills everyday. 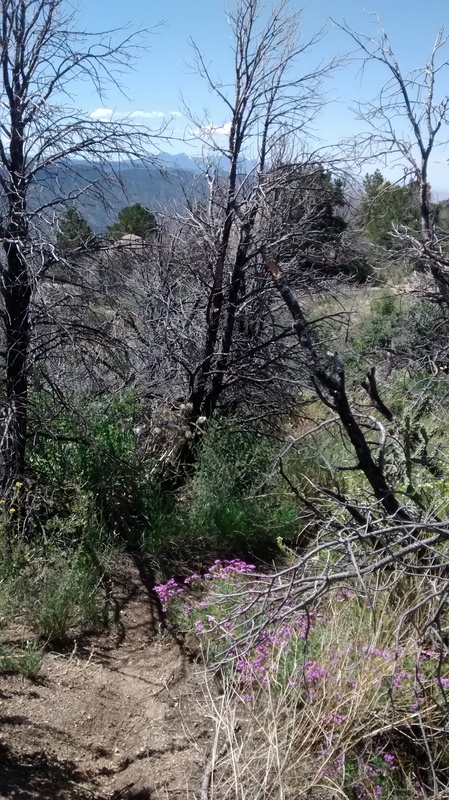 The extensive trail system gets people walking. Doing ignites experiential learning. We had a funny realization while walking. 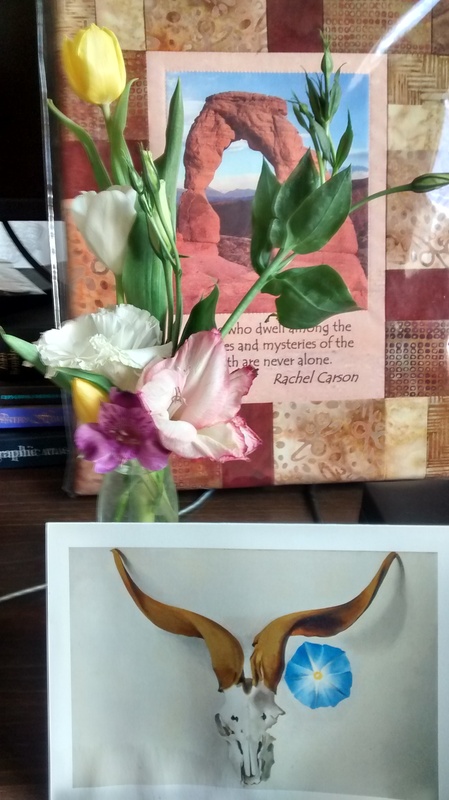 It was our anniversary the previous day! What saved me was that Mai forgot too. Being up on the Crest together was a great way to start celebrating. We reflected on how Albuquerque is a wonderful city, and how by living here we find opportunities to learn more about the big picture of the world around us. Crest and city, each a form of each. Crest and the city, a wonderful pair! The Santa Fe Institute uses Complexity Science to study economic growth, social networks, transportation, and all the activities that fuse together in cities. There are upcoming city planning meetings for citizens to express their voice and help with envisioning. 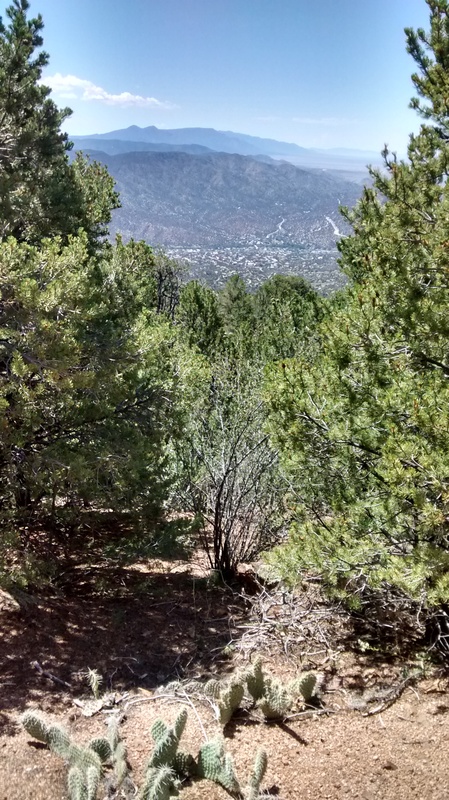 The Albuquerque Bernalillo County Comprehensive Plan is being updated along with the zoning ordinance, and in the process the planning agencies are conducting focus groups to instigate dialogue that will help set the tone for the planning framework. 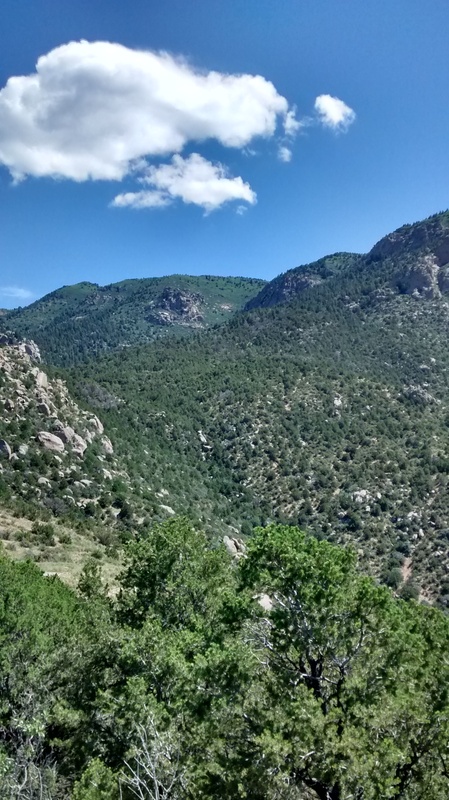 This entry was posted in Everyday Rides, exploring by bike, Landscape, New Mexico, Open Space, planning, Walking and tagged Complexity Science on July 20, 2015 by bikeyogiblog. 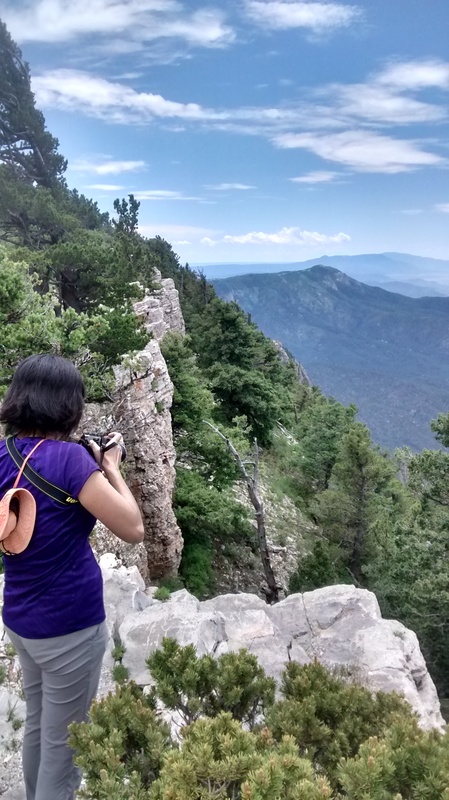 Here’s a short fundraising & campaign update with photos from the Sandia Crest in July! I’ve been busy researching and writing my bicycling guide Elements of Cycling. 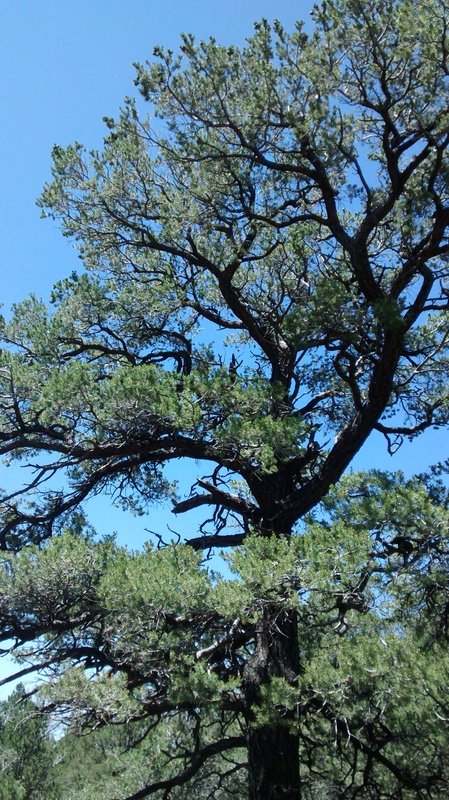 And doing lots of outreach, communication, and education work in the Southwest U.S. region. Please join the 17 grassroots supporters that have donated to my work at Crowdrise to help me reach my goal! When we set out to teach we also become students ourselves. It has worked this way for me during the past year researching, writing and working at bikeyogi.com . I’ve accomplished some of the goals I set out to do, and discovered more about the work that needs to be done. I’m organizing a networking and partnership program called the Southwest Bike Initiative focusing on what bicycling can do for diverse constituents. We are helping businesses, neighborhood associations, developers, non profits, governments and more realize and apply how bicycling can help fulfill their mission and make progress toward their goals. We support and work with existing bicycling orgs and add new capacities to expand bike initiatives. I’m continuing to race and work at events sharing my enthusiasm for bicycling. 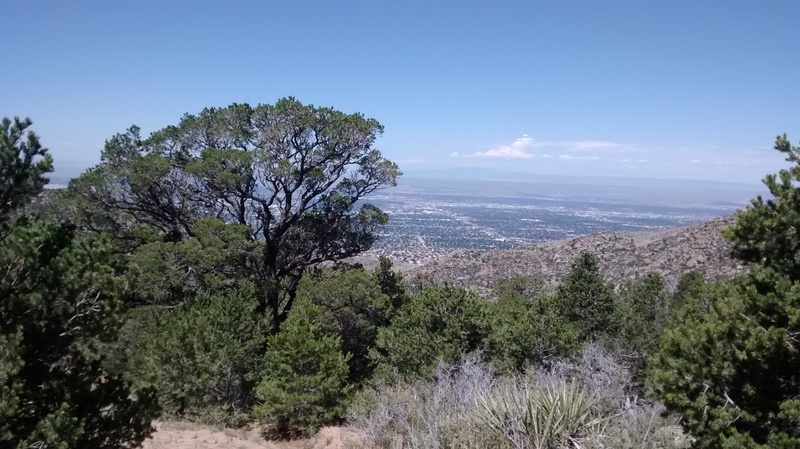 I won the New Mexico State Road Championship in June, and the Sandia Crest race up Albuquerque’s highest mountain. These build on the four State Championships I won in Arizona at the top amateur level. With your support I’m planning on going to the US Masters National Championships in Utah. 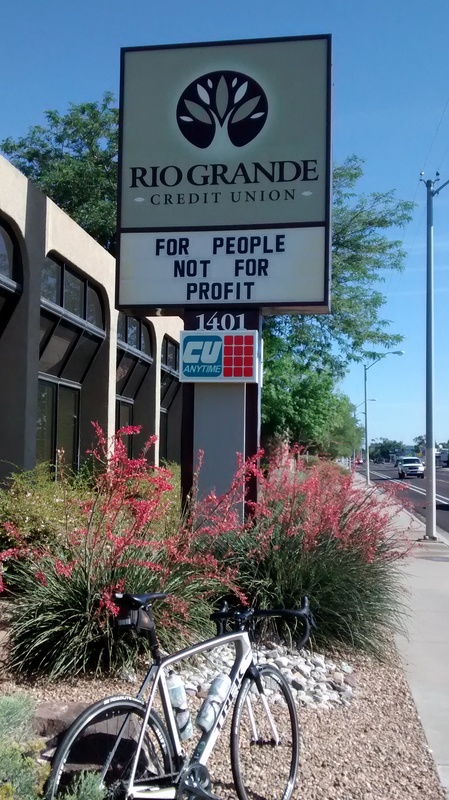 I keep striving to exemplify honorable bicycling, and equally enjoy every aspect of practicing cycling including family rides, community rides, social events, research rides for bike planning and evaluation, and everyday rides to meet my regular transportation needs. Practicing cycling every day is key to staying in touch. Bicycling is contagious. Bicycling for all! I’ve done a lot of service learning, and am sharpening my working skills as a transportation and sustainability professional with technical trainings and skills development. My network of partners and community connections is growing and I see new opportunities opening up to make a difference. I greatly appreciate your support of my start up fundraiser so I may continue this important work supporting people bicycling and developing all the components that make up the bike ecosystem and synching them up in an integrated way. Thank you! 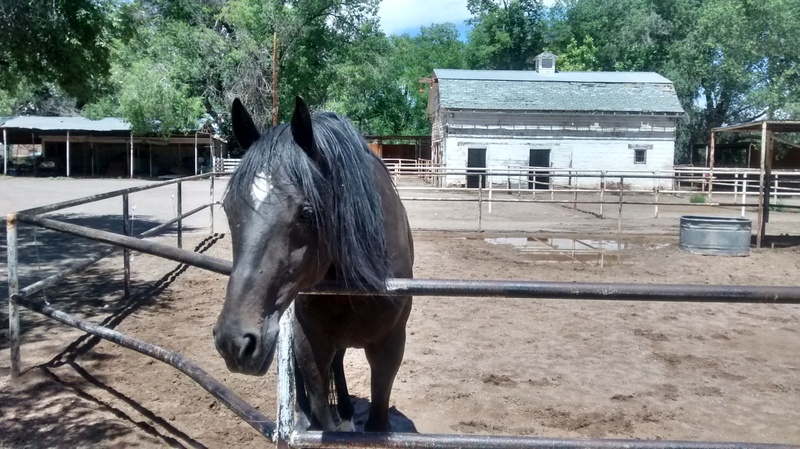 This entry was posted in initiatives, Public Participation, Uncategorized and tagged Fundraising on July 17, 2015 by bikeyogiblog. Click here to connect to your Senator. It is essential to have the guidelines in place to support the development of an inclusive, balanced, affordable and accessible infrastructure so we have healthy transportation choices. Great walking and biking and transit is not only incredibly important now but it is a way to leave a positive legacy. You don’t have to be a member of the Bike League to use their take action services. My Senator, Tom Udall, respects word from his constituents and uses public input to guide his decision making. Thank you Bike League for making it easy to correspond with our representatives on critical issues. Rails to Trails Conservancy also has an action portal for this issue here . Please let your Senator’s Office know what you care about. These Federal decisions have significant impacts on setting the tone and scheduling the resource expenditures at local levels, where you live, walk and ride. The most direct way of being involved is via bicycling every day. I have done my dual duty today. If you are looking for more riding, consider these two fine events this weekend. 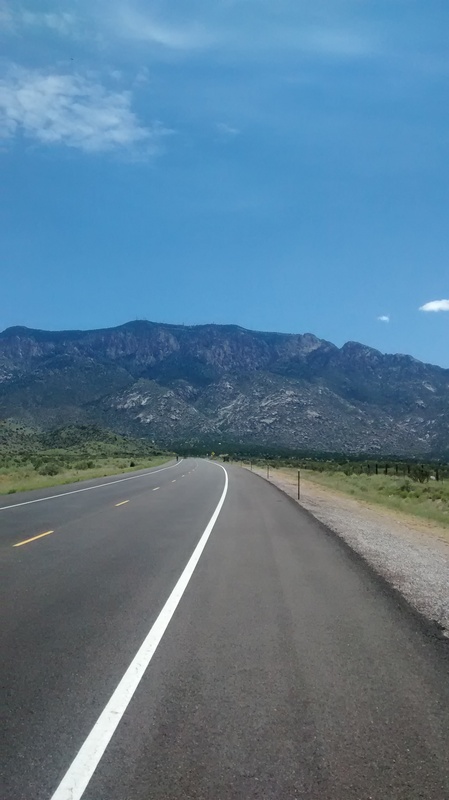 These are small town based multiday cycling events in spectacular Southwestern country. Reach out to your elected officials about your love for cycling. Pedal every chance you get. Both ways of being involved are worth every moment. Arigato from the American Southwest! 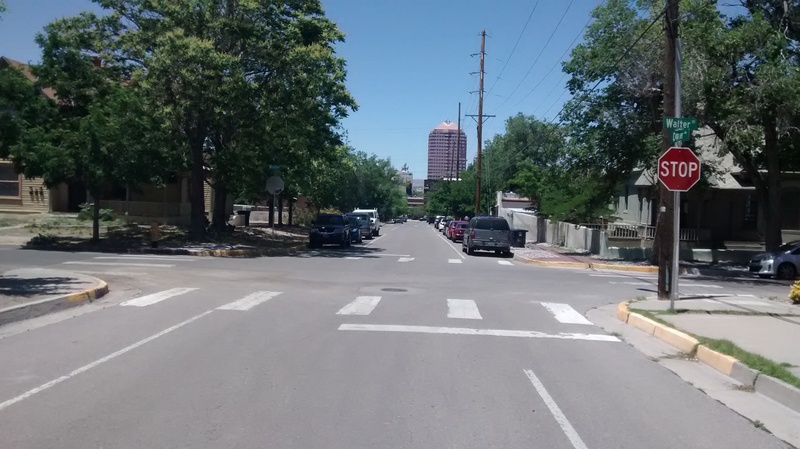 This entry was posted in ABQ bikeways planning, bicycle rides, Elements of Cycling, Public Participation and tagged Voting on July 14, 2015 by bikeyogiblog.